The historically and factually challenged Rep. Michele Bachmann (R-MN) is shaping up to be the Republican Party's nominee for President in 2012. I never believed she would get this far, but her numbers are rising quickly, and the presumptive frontrunner, Mitt Romney, is hemorrhaging support. In a recent poll of Iowa Republicans, Bachmann has surged ahead of Romney and is now in 1st place. I find this hilarious, as Romney is pretty much the only candidate on the Republican field who could get anywhere near defeating Pres. Obama next year. Bachmann's surge has even caused fellow Minnesotan, Tim "no, really I'm a fighter" Pawlenty to start attacking her (in the aw shucks way that he does.) Pawlenty called her legislative record in Congress, "non-existent." This, of course, is true, but it hardly matters to her supporters. When Michele Bachmann claimed John Quincy Adams was a founding father (despite being aged 9 at the time of the Declaration of Independence), her supporters actually tried to change the Wikipedia page on JQA to make it square with her version of history. Facts simply do not matter to these people. Pres. Obama has been blessed in the past with some easy electoral opponents in his political past. Alan Keyes in 2004 comes to mind. The Republican Party, entering into the equivalent of a suicide pact by nominating Bachmann, could easily continue that lucky streak. 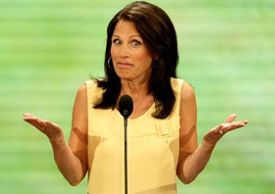 Bachmann will not be able to contain the crazy no matter how many professional handlers she has.